When it comes to the world’s most revered winemaking destinations, there are a few coveted regions that reign supreme. Think Bordeaux in France, California’s Napa Valley, and the Duoro region of Northern Portugal. But many consider Tuscany to be the crown jewel, sprawling along central Italy’s Tyrrhenian coast. It’s home to awarded areas, such as Chianti, Montepulciano, and Carmignano. Here, tucked away in Tuscany’s verdant valleys, is one winery that’s particularly noteworthy—considering it’s operated by a pair of sisters who happen to be real-life Italian princesses. The Guicciardini Strozzi Cusona Estate is hidden in San Gimignano’s emerald hills, right in the heart of the Province of Siena. Members of the Strozzi family still operate the winery, which boasts more than 1,300 expansive acres along with an impressive legacy tracing back to the year 994 A.D. Through the centuries, the Strozzis were considered one of Italy’s most noble clans, and had a significant hand in influencing the history of Tuscany, as well as Italy and Europe as a whole. To paint a better picture of just how prominent the family was, consider this: There’s about a 99.9 percent chance you’d be able to instantly identify the family’s most famous face. Current living members of the Strozzi family tree are widely believed to be fifteenth generation descendants of Lisa Gherardini del Giocondo. Doesn’t sound familiar? She’s also known as La Gioconda, but is undoubtedly best recognized as the woman sporting a coy smile in Leonardo da Vinci’s ubiquitous masterpiece, The Mona Lisa. Yup—they were that important. The aristocratic Strozzi dynasty first rose to power in the thirteenth century, amassing their enormous wealth and influence as bankers and merchants before later transitioning into the turbulent political arena. As direct opponents of Italy’s infamous Medici family, they were eventually banned from Florence, leading them to continue building their empire elsewhere, in regions such as Naples and Siena. The feuding families ultimately married into one another, but the storied saga between the two economic and political powerhouses rivals even the most gripping fictional vendettas. Cutting to more recent times, Italian Prince Girolamo Strozzi began selling the family’s prized wines to international markets in the 1970s, receiving critical acclaim along the way. Today, he and his wife still run the business, working alongside their two daughters, Natalia and Irina, to operate the Guicciardini Strozzi Cusona Estate. 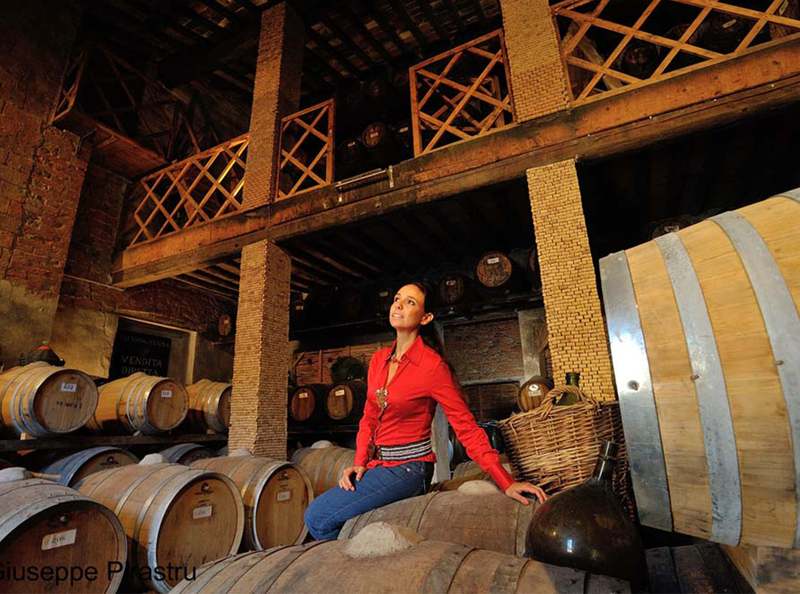 With a penchant for winemaking and a legacy more than 1,000 years in the making, both princesses have dedicated their lives to continuing the tradition of producing award-winning wines. Over the centuries, their celebrated varietals have been enjoyed by some of Italy’s most illustrious visionaries, including Michelangelo, Dante, Boccaccio, and even the Pope. And now, thirsty travelers and oenophiles from around the world can visit the winery and sip the family’s signature wines for themselves, thanks to a new collection of ultra-exclusive experiences launched by Baglioni Hotels and Resorts. If the Baglioni name rings a bell, it’s because the brand has built quite a reputation for itself within the hospitality industry as Italy’s only independent-owned, luxury hotel brand. Their portfolio of properties spans Italy’s most important cultural hubs, including lavish hotels in Milan, Venice, Florence, Tuscany, and Rome, in addition to international locations in England, France, and an upcoming launch in the Maldives, slated to open in 2019. During a wine tasting at the Guicciardini Strozzi Cusona Estate, Natalia and Irina start the afternoon by welcoming visitors and leading an all-access tour of the winery, explaining the family’s rich history and their winemaking process. Afterwards, the princesses host an intimate tasting featuring a lineup of their favorite varietals that are grown, harvested by hand, aged, and bottled on-site. According to the Strozzi sisters, white wines were once the region’s most distinguished signatures before the rise of Chianti, so be sure to sip on their sparkling white spumante and grappa made from Vernaccia grapes. Other standouts include Sodole, a red wine that exclusively uses San Giovese grapes, and Millanni, another remarkable red produced in honor of the estate’s 1000th anniversary. Dedicated to creating uniquely authentic Italian moments for all of their guests, wine tasting with princesses is just one of the VIP experiences available through the recent launch of their Assoluto Signature Programme. Unique to Baglioni Hotel Regina in Rome and Baglioni Hotel Carlton in Milan, the mission is to bring guests on tailor-made journeys to discover Italy’s most renowned craftsmen and tastemakers, along with an unforgettable stay in one of their opulent suites. Examples of other exclusive experiences range from meeting with iconic musical groups (like internationally renowned trio Il Volo); some of soccer’s brightest stars (such as Andrea Pirlo and Alessandro Del Piero); and savoring the lauded culinary delights of Chef Vito Cortese (known as the world’s first gourmet and 100 percent vegan raw-food confectioner). Guests are also welcome to create a wish list of desired activities not currently offered through the program, and the Baglioni team will strive to make magic happen. Needless to say, when it comes to soaking in the best of Italy’s most exclusive experiences, there’s no better way to do so than with Baglioni’s Assoluto Signature Programme. And after an afternoon spent with the Strozzi sisters under the Tuscan sun, that bottle of red from your neighborhood wine shop will never quite hit the spot the way it used to.